How would you respond if someone asked you: Is a hammer the right tool? Clearly, you would say something like, I don’t know. What are you trying to do?. If we think of technique (i.e. how we move our body and paddle through space) as the tools we use to play pickleball, then the question “Is this good?” can only be answered by a follow-up question: I don’t know. What are you trying to do?. And that question What are you trying to do? is a question about tactics. And that is the focus of this edition of For The Coaches. Players stack to make it more likely they get the positioning they want. featured: Corrine Carr Siebenschein and Wes Gabrielsen. 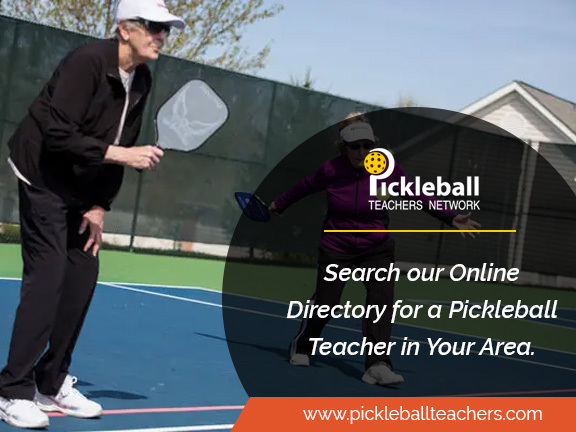 Use the promo code PCI to get 6 months of free premium access to Pickleball Teachers Network — the best online directory for PB instructors. What’s your plan? It is amazing how often beginning, novice and intermediate players hit the ball without thinking through what they are doing and why. This is largely because they haven’t had someone push them to consider it before. Can you tell me what you were trying to do? What players do with the ball and what they were trying to do are not always the same. Asking them about what they were trying to do tells you something about their tactics. What do you think they are trying to do? The less skilled your students are, the less they consider what’s happening on the other side of the net. Encourage them to pay attention to that tactics their opposition is trying to use - that is the first step to countering it effectively. How are you winning most of your points? Even if they can’t always execute it, encourage your students to think about their strengths and what is working for them. How is the other team winning most of their points? Good players don’t just use their strengths, they avoid the strengths of their opponents. Have your students articulate what they see as the other team’s go-to plays and think about how they can respond. If a power game is effective, keep using it. featured: Tao Thongvanh and Jack Oxler. Sometimes coaches think that tactical thinking is only for advanced player. This is wrong. While advanced palyers may use advanced tactics, that doesn’t mean that beginning players need to be satisfied with ‘just hitting the ball’. Here are some important tactics you can work on with your starting pickleballers. Pressure with Consistency. All you have to do to win a point is get the ball in play once more than the other team. Make sure your players know this. Encourage them to be a team that is tough to get the ball past. And while it might not always be pretty, an attitude of find a way to get the ball in play can be really helpful for new players. Take Away Time. Beginning players will know that they’d prefer to have more time to get set rather than less. Encourage them to use this knowledge when it comes to thinking about what they do to the other team. Returning serve and running to the net is a great way to take away time. So is getting the ball when it it high so it is easier to hit down in the court with speed. Use Your Strengths, Avoid Your Weaknesses. While it may not be the best solution for overall player development, the attitude of do the things you are good at as much as you can and stay away from the things you aren’t so good at can be valuable for teams that want to be competitive. Pulling an opponent off the court is a useful tactic for players of any level. Sometimes you will hear people suggest that players should only learn tactics after they have developed solid technique. In our view, this is misses the mark. Recall that technique is a tool. And tools should be used to do something. And that something is apply a tactic. Pickleball isn’t gymnastics or synchronized swimming; you don’t win because it looks pretty when you hit the ball. Technique shouldn’t be taught for its own sake. Instead, if you begin by saying something like: So, what should we to to these other players? you have opened up the door to have students who are invested in learning the techniques that will allow them to accomplish their goal. In this construction, tactics begin the conversation about why technique is important.